he Hadrian Stone Design Studio & Gallery features regional and local artists with a new show every month, including impressionist Benjamin Vanderwerff. Benjamin loves painting landscapes and has recently experimented with urban nightscapes. Did you know he is also a concrete artist apprentice with gallery owner Houston? The new medium has afforded him a whole new way to make the world a more beautiful place with geometric flower pots, marbled concrete coasters and more. Houston Foist and his design team use a proprietary mixture of glass fibers, sand and concrete to create countertops, sinks, indoor/outdoor furniture, mantels and more. Envision concrete countertops that look like warm wood or luxurious stone, without the high price tag. They are able to add incredibly unique touches such as embedded memorabilia, acid etch images and text that will last a lifetime. Their incredible line of custom garden benches like the ones pictured on the left are displayed at the gallery. Hadrian Stone Design combines exquisite design and durability to create pieces that can convert your humble back yard into an elegantly styled garden. Bring sophistication and style to your garden parties with these stunning pieces. Visit the gallery during the first weekend of every month to experience reveal of a new show with live demonstrations. NW.Life Visit our website to learn more about local and regional adventures, art, music, businesses and charities. YummyAlert.com Hungry? Go to Yummy Alert to learn more about local and regional eateries! NW.Life/Newsletter Sign-up for our newsletter to find your next Northwest adventure. SPONSOREDADVERTORIALS Articles denoted with the paid for by a business. Do you ever feel a bit of wanderlust? A desire to seek out new adventures and get away from the usual routine? One of the things I love about the Great Northwest is that you don't have to travel far to find scenic getaways, shopping opportunities, and foodie adventures. This issue is a true labor of love with an updated design chocked full of articles about local adventures, a road trip or two, and photos from scenic regional getaways. We have expanded our focus to include Whatcom and North Snohomish County so we can feature even more great businesses, musicians, artists, nonprofits, getaways and adventures. Not all who wander are lost, some are on a road trip. ;) Our Shopping and Services section has grown from last issue and includes a few of my favorite articles like our One-Of-A-Kind Shops article, Artisan Makers article, Must-Try Massages guide and Girls Shopping Spree article. We are happy to be welcoming a new member to our team, Rocket the NW Pup. You can find his  paw print of approval on all of the dog-friendly restaurants, breweries and shops. Check out his guide of Northwest Dog Parks on page 9. Did you know that we donate 25% of our profit to local and regional non-profits? If you would like to donate to this issue’s non-profit, the Whidbey Veterans Resource Center, please go to WhidbeyVRC.org/donate. To learn more about this nonprofit go to page 14. P.S. Stop our website to find even more NW Getaways like our Farm Stays Getaway at www.lcl.bz/FarmStays! 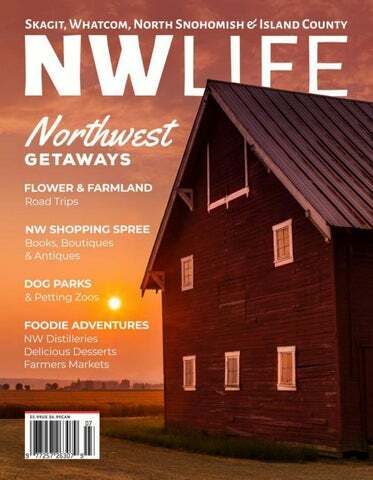 Tag your getaway pics with #NWLife for a chance to get featured online! FARMLAND ROAD TRIPS From lavender to fresh berries to tulips, the farmland in the Northwest makes for a perfect sightseeing road trip! f you head about an hour north from Seattle, you’ll discover Skagit Valley, a delightful respite from the hustle and bustle of city life. Famous for its tulip fields that rival those of Holland, visitors adore the charm of artistic waterfront towns and bountiful outdoor activities. At  Little Mountain Park in Mount Vernon, be sure to allow a lot of time to explore the number and variety of paths for hikers, bikers, runners and walkers! You’ll also want to have your camera ready because the Pickering and North Viewpoints offer breathtaking, 360-degree views of Skagit Valley! You may feel like you’ve stepped into an episode of Downton Abbey when you arrive at Willowbrook Manor in Sedro-Woolley. The grand, 9-acre estate offers unique lodging on its chamomile farm. Tea and scones are served each morning. Guests also have the option of taking a scenic countryside bicycle tour. Skagit County has an amazing array of sweet and delicious ice cream that is sure to satisfy your sweet-tooth! Don't forget to stop by these shops on your next Skagit Getaway! Be sure to have cash in hand for a colossal cone at the  Snow Goose Produce Market! Featuring classic flavors like Cookie Dough and exotic offerings like Black Licorice, their yummy, all-natural ice cream is presented in a homemade waffle cone. We all scream for ice cream! C-Square Cones is located just a few blocks from downtown Mount Vernon. They use organic milk and cream from area farms for their delectable handmade ice cream, frozen treats, sundaes and floats. If you have an Italian grandmother, you know the food at Mambo Italiano Cafe is the real deal. Their made-from-scratch pasta, pizza, seafood and desserts are delizioso! On the third floor of the historic Sycamore Square building, you'll find The Black Cat (Le Chat Noir) restaurant, a fave of both locals and visitors. Their cool, dark and elegant ambiance might just remind you of a chic French bistro. Enjoy a glass of wine with  Övn Wood Fired Pizza's signature Fondue appetizer. Rosemary, gruyère, brussel sprouts, prosciutto - their artisanal ingredients will make your mouth water (and your tummy happy). A small-batch brewery that is BIG on adventure! Stop by Stones Throw Brewing Co. for a Raincountry Liquid Sunshine or a Total Eclipse of the Hop on your way back from a hike or before a boat ride around the bay. Their cozy taproom welcomes both kiddoes and doggies. place to hang out at any time of day. Get your morning started with a Cappuccino and a Rustic Breakfast Wrap or wind down in the evening with a glass of Merlot and a White Cheese Platter. This is just a small selection of the delicious dishes and drinks that await you in the Great Northwest. Find your next foodie adventure at YummyAlert.com! hether you and your besties want to shop until you drop or you're looking for a fun excursion with the family, Fairhaven, Washington is filled with boutiques, eateries and beautiful views. For a special piece of jewelry you won't find anywhere else, stop by the aptly-named  Whimsey. With an array of necklaces, earrings, rings and bracelets created by over 20 artisans, it's easy to forget about time when you peruse this airy, colorful shop. There is nothing cookie cutter about the carefully curated clothing, gifts and home decor at the  Three French Hens boutique. They carry designer apparel lines like Eileen Fisher and Tribal, elegant bath & beauty products, and stylish home decor - all with a French flair. Tres' Chic! You probably have been wine tasting but have you ever had an olive oil tasting? At  Drizzle Olive Oil and Vinegar Tasting Room, you'll be introduced to their high-quality, delicious olive oils and balsamic vinegars. tep outside and take advantage of miles of hiking trails, serene parks, and special spots in and around Bellingham that allow you to unplug from the world. With endless activities in the great outdoors, the only problem is deciding what to do first. Dating back to the 1890s,  Whatcom Falls Park is steeped in history. The stunning combination of tranquil woods and cascading waterfalls makes for a mystic experience. The Fish Hatchery is teeming with trout that stock lakes and rivers across the state. Walk across the iconic Chuckanut Sandstone Bridge for a premium view of Whatcom Falls. On a hot day, visitors cool off in “The Whirlpool,” a popular swimming hole that offers a 60-foot cliff for adventure seekers. Plan to play at the park the whole day? You can make use of the picnic tables, barbecue areas, playgrounds, sports courts and the pup-friendly off-leash area at the south end of the park. Art and nature collide at a one-of-a-kind city park tucked above Lake Whatcom.  Big Rock Garden Park displays dozens of original sculptures by local and international artists. The diverse collection features mediums of concrete, granite, steel, and wood. This outdoor exhibit is permanent yet ever-changing as the spring flowers give way to autumn leaves on maple trees. Open year-round from dusk until dawn, the whole family will enjoy a stroll through the peaceful grounds. PETTING ZOOS If you are an animal lover, there is a virtual menagerie of critters to interact with on regional farms. Weâ&#x20AC;&#x2122;ve compiled a list of fantastic beasts (and where to find them) in Snohomish County! You would normally have to book a trip Down Under to see amazing kangaroos and wallabies roaming free. At The Outback Kangaroo Farm, no passport is required! On a guided tour, guests can meander along with the Aussie marsupials as well as lemurs, alpacas, llamas, birds and more. Cuteness alert! Kids of all ages will love the hands-on experience at  Forest Park Animal Farm. This compact petting zoo has a large variety of furry friends that are ready to meet you. Snuggle with a bunny, pet a goat, watch pigs play, see ducks swim, and even ride a pony! The creatures at The Reptile Zoo may not be soft and cuddly, but they make up for that with their coolness factor! Get up close and personal with exotic reptiles from around the world. Alligators, lizards, and snakes including a deadly Black Mamba! And, no you arenâ&#x20AC;&#x2122;t seeing double, that's a turtle with TWO heads! Friendly zoo keepers are on hand to provide a fun and educational experience. To find out about more adventures, please visit NW.Life! og lovers in the Pacific Northwest will find that they have lots of options for bringing their four-legged companion with them on their outdoor adventures. Whatcom County's Lake Padden Dog Park This dog park is packed with off-leash trails, lake areas, and fenced-in areas to let your buddy stretch his legs. Skagit County's Ace of Hearts Rotary Dog Park One and a half acres of open-run doggy playground can be found in this public park. Here you'll find two fenced areas, ample water supply for your pets, and a large covered shelter. Island County's Marguerite Brons Memorial Park If you're looking for something a little wilder, you can stop by this 13-acre dog park. Throughout the park, you'll find lush meadows and quiet woods filled with dogs of all sizes and their owners. Snohomish County's Strawberry Fields for Rover Off-Leash Park There are plenty of places for your pup to find adventure at the Strawberry Fields Dog Park. Well manicured grass areas and fenced areas provide plenty of fun for your pet. ead 15 minutes north from bustling Seattle and you'll find yourself delightfully nestled between the majestic Cascade mountains and the Salish Sea. With coastal towns, historic districts, state parks, and regional cuisine, North Snohomish County is a great day trip or weekend getaway! A magical place that's doing important work,  Bonhoeffer Botanical Gardens in Stanwood is home to 20 acres of uniquely native NW flora, including endangered species. Kiosks provide shelter on a rainy day as well as a habitat for butterflies. There is also a mile-long wheelchair-accessible path. If you visit during the spring, prepare to be dazzled by Daffodil Hill with 400,000+ sunny, yellow daffodils surrounding a 115-year-old church. Looking for a seaside activity? Check out  Kayak Point in Stanwood, a breathtaking saltwater beach park. With 3,000 feet of shoreline along the Puget Sound, visitors can enjoy boating, fishing from the pier, and hiking. At Rockaway Bar & Grill, you can nosh on Portobello Mushroom Fries with one of their signature cocktails, or have a leisurely lunch in their warm and inviting atmosphere. You'll find the 3 B's at The Baked Cafe: bread, breakfast, and burgers! They do comfort food with care, grinding their own meat and making the buns fresh daily! You don't have to fly east to have New Yorkstyle pizza.  Brooklyn Bros. Pizzeria has been serving up family recipes since 1977. Got somewhere else to be? Fuhgeddaboudit! Itâ&#x20AC;&#x2122;s time for NYC pizza on the beach! An English pub in an island setting,  Ale Spike Camano Island Brewing Co. rotates about 10 of their own crafted beers like Eagles Landing Pale and saves three taps for guest offerings. You don't have to avert your eyes at  Naked City Brewing Company, but you will see they have removed gluten from many of their great-tasting beers! Drink a brew on their large patio and try a dish from the seasonal menu. Proud to be small,  Dusty Cellars Winery takes great care with the 700 cases a year it produces. You'll savor every handcrafted sip! Empty nesters-turned-vintners, owners of  Edward Lynne Cellars are passionate about Washington varietals like their floral Madeleine Angevine and Siegerrebe white wines. ross the Camano bridge to start your Island Getaway. Camano Island boasts miles of beaches, parks, fishing, outdoor adventures, eateries and gorgeous views of the Puget Sound and the Olympic Mountains. You can jam-pack a day or spread out the many fun activities over a relaxing weekend. You'll find that Camano Island is easy to get to but really hard to leave! Fine art and nature seamlessly connect in Matzke Fine Art and Design Sculpture Park, a 10-acre outdoor gallery. As you follow the peaceful trails, you'll come upon 3-D sculptures made of iron, stone, bronze, glass and wood that rest in harmony with the evergreens and NW fauna. You can stroll through the magnificent woods on Kristoferson Farm or you can FLY through them on a zip line! The whole family can enjoy an adrenaline-filled adventure with Canopy Tours NW, offering six different zip line tours, each including a fun ride in an Unimog forest vehicle. Passage on the southwest shore of Camano Island. A variety of boats are for rent at the Cama Beach Livery. Whether you want to be hands-on and row, let the wind help you on a sailboat, or cruise the Sound in a motorboat, you'll have an amazing day on the sea. Spyhop Public House may be a small town pub but their food is big on flavor. Their juicy burgers are made with local, Painted Hills® natural beef and the cocktails are made with freshly squeezed juices. Be sure to try The Island Sipper! ust 30 miles north of Seattle is the largest of the isles that form Island County, WA. Whidbey Island is like ten getaways in one! With sandy beaches, forest hiking trails, fishing, wineries, restaurants and premium lodging, your to-do list will be delightfully long. You may have heard of tiptoeing through the tulips. At  Meerkerk Gardens you can run through the rhododendrons! You can also leisurely stroll through the ten acres of gorgeous white, pink, red, & purple blooms, passing by magical ponds and stately trees. See if you can find the "secret garden" in the woods! The atmosphere at  Flower House Cafe is as cheerful as its menu! Located at Bayview Farm & Garden, visitors can order a yummy sandwich or a freshly made scone then happily wander through the garden center and sunny yellow arbor. Sitting in the middle of an organic farm, Orchard Kitchen, is a crown jewel. They amaze guests with their always-changing, 4course menu that lets the local ingredients like fresh mussels, artisan cheese and garden mushrooms shine. Whidbey Island Kayaking allows you to customize your time on the water with a variety of adventures to choose from like the Early Morning Light, Private Couples, and Birdwatching Kayak Tours. You’ll have the best seat in the house to take in the mountain ranges, wildlife and coastlines. Visit the charming Whidbey Island Winery and you’ll see why they are highly regarded and award-winning vintners. Savor a glass of estate-grown Madeleine Angevine or Island White NV in the 100-year-old apple orchard. Noir grapes organically on their estate. As their name suggests, furry friends are welcome on the patio! ove your partner from the earth to the moon? Want to treat them real soon? Use our Romantic Getaways guide to plan a weekend getaway that'll make them swoon! Enjoy a romantic island stay at Wildwood Farm Bed & Breakfast in Oak Harbor! Venture through their 80-acres of wooded trails and pastoral roads perfect for a long romantic walk! Experience life on a real horse farm by observing their professional staff caring for over 50 horses or be a little adventurous with their lessons and trail riding. Indulge in luxury at the  Country Cottage in Langley! They offer cottages with a private deck, cozy fireplace and relaxing hot tub. Overlooking the Puget Sound, guests can enjoy a view of the water from their bed! The Chuckanut Manor in Bow has two properties on scenic Highway 11 - a 2-bedroom suite and a 1-bedroom cabin stocked with continental breakfast items for an indulgent breakfast in bed! You'll catch amazing sunsets as you walk to the nearby Chuckanut Restaurant. en years ago, a couple searched for help for their son who was struggling after his return from combat deployment. Finding no local services, they created the Whidbey Veterans Resource Center (WVRC). Today, the WVRC carries on the original mission of creating a place for Veterans to have camaraderie with their fellow vets, receive counseling, and get assistance with the VA benefits and healthcare system. "Many Veterans we meet are unaware of the benefits for which they are eligible and we can help them with the application process," explains Volunteer Coordinator Dana Sawyers. The WVRC offers educational VA benefit sessions, aid with paperwork, and rides to the VA facilities in Seattle. Veterans and spouses, many of whom are senior citizens, are paired with what they call a "co-pilot" to help navigate the large VA facility. Groups for men, women, and spouses meet weekly for fellowship and support at the WVRC. In 2018, the WVRC added two new programs including a rideshare van offering free transportation to the VA facilities for veterans & their families and free confidential counseling during after hours. Their licensed mental health counselor and fellow Veteran, Jeffrey L. Rogers, has years of experience helping those who've served in the military and their families. If you are interested in making a financial contribution, please visit their website. Watch our video interview with members of the Whidbey Veterans Resource Center to learn more about this amazing group. The members of the Whidbey Veterans Resource Center range from Veterans and their spouses who want to help their fellow service men and women to local residents who want to give back to those who served our country. There are plenty of opportunities to volunteer. You can provide rides for Veterans and their families to the VA facilities using the WVRC ride-share van, train to be a services officer and answer Veteran's questions, or just keep the coffee pot brewing. To make an appt or find out how you can get involved, please call (360) 331-8081.
he Sky Colony once had their sound described as “music my dad would listen to” . At first, the lead vocalist Kyle Findley-Meier didn’t know what to think, but the more that he thought about it, the more it made sense. They draw inspiration from the 60s & 70s-style folk and artists like Neil Young and Jackson Browne. “That kind of music was not only awesome but pivotal for social shift,” Kyle explained. The band embraced the description, making the phrase their tagline. Their creative process begins and ends with emotion. Kyle relishes the opportunity to be around other artists he admires. "I really enjoy emotive vocalists - people who can sing a song and make you feel it," he explained. Founders and songwriters, Kyle Findley-Meier and Ben Meyer are inspired by the human experiences and challenges we all have to work through. Kyle and Ben started by collaborating on music together longdistance by sending cds through the mail, before Kyle took a job working on the same farm as Ben in Oregon. Kyle received a call from a friend of a friend in Washington who had lyrics they wanted to make into songs. Through the process of taking these lyrics and transforming them into songs, Kyle and Ben realized they could make this band thing work, so they both moved back up to Washington. A week before their first concert, they received a call from the commissioner of the project, they decided they wanted to keep the lyrics private. So they had to write new lyrics to all of their songs, in just one week! The audience loved the new lyrics, so they forged on creating their unique blend of psychedelic folk and indie rock. Kyle Finley-Meier is the lead vocalist, plays Rhythm Guitar and writes songs with lead guitarist Ben Meyer. Jeff Lacy plays the drums, and Marcus Nevitt plays the keyboard and lap steel guitar. Kyle loves the process of working with musicians who are great at their craft. He can bring lyrics and a melody to the rest of the band members, and each one will fill in the song with their own instruments until they have a completed track. The Sky Colony is working on their second full-length album which will come out later this year. 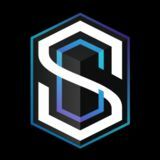 Recorded in Whatcom County, they focus the original music on internal healing and the need for “unity amidst chaos.” To find out more about The Sky Colony and hear their music, check out their website: TheSkyColonyMusic.com. Photographer Marianne Stickles got her start with a Canon AE-1 when the film was painstakingly developed in a darkroom, unlike the instant gratification of today's digital cameras. "The darkroom was great fun, and I loved everything about it," she recalls. "It was mesmerizing to see the film develop before your eyes!" Her inspiration is as vast as some of her subjects, from a sunset that sweeps vibrant color across the sky to the intricacies of a single flower. But secretly her favorite may be trees. "I see so much in a tree. I love every part of them - leaves, bark, the way the limbs stretch out. There can be such a gracefulness about them. On the other end of the spectrum, how many of us have seen 'scary' trees of childhood books? They provoke emotion." Poplar trees stand at attention like soldiers in her dazzling photograph of a daffodil field at sunrise (shown here). Marianne marvels at how the pinks and golds mixed with the blue sky. "What a sunrise this was! The colors were amazing. It really was glorious! I love the way [the trees] stand so straight and stately." In Skagit County, she only needs to walk outside her door for more inspiration. "All of it is inspiring to me. There are so many options for a photographer. Fifteen minutes from home can give me a boost for the entire day. We live in an awesome place." BRENDA CALVERT You would be hard-pressed to look at Brenda Calvert’s artwork and not instantly smile. Her color palettes and ability to bring out beauty in everyday objects is a heartening combination. The Lynden artist’s style is realism, which results in photograph-like paintings. When she started out, Brenda took her own photos. Today, she works from her client’s precious pictures which she brings to life on the canvas. “I love to create pieces of art for my clients from their special memories,” she explains. Brenda’s medium of choice is acrylics because they allow her to blend colors and have a quick drying time. She uses them to paint her favorite subjects: landscapes, flower bouquets and birds, especially sparrows. Brenda teaches art classes for all age ranges from kids to adults. She loves being an example of a working artist to her students, being able to answer their questions and guide them on their journey. She recently completed a Barn Series, and didn’t have to look far for a muse. “I’m inspired by the land in Whatcom County. It’s so beautiful here!” While some of the barns are from her hometown, she also created the hashtag: #BrendaShouldPaintThis on Instagram. Followers submitted their barn photos and Brenda picked one to paint each month. The lucky winner received a copy of it. The final collection includes quaint barns from all over the United States. To view Brenda Calvert’s art, commission a custom work, or learn more about her art classes for kids, visit brendacalvertart.com. levate your next date night with a Romantic Foodie Adventure at Encore Restaurant inside The Skagit Casino Resort in Bow! Set the mood with a Mint Julep where smooth small-batch Angel’s Envy Kentucky Straight Bourbon meets crisp mint and sugar to create a drink worthy of a derby (or just a night out)! Then, indulge in the melt-inyour-mouth Filet Mignon that marries the succulent flavor of tenderloin with the bite of Point Reyes Blue cheese. Served with a stack of garlic & Gruyère scalloped potatoes and fresh asparagus, this flavorful locally sourced, grass-fed prime beef tenderloin is guaranteed to make any evening special! Finally, prove your love by sharing a dessert you really want all to yourself... Salted Caramel Cheesecake. Almond biscotti crumbles serve as the crust for this New York Style cheesecake blanketed with white chocolate mousse and salted caramel. Finished with a shard of peanut brittle and served in a glass jar. Love is in the air at the Encore Restaurant. TRULY LOCAL BEER Every glass of Farmstrong Beer comes from grain that was grown, malted, and brewed in Skagit County. It's the freshest, most "truly local" beer you can drink. All ages welcome! he PNW is known for its great wine, but the distillery tasting scene is really hot, too! We have about a dozen craft distilleries right here in Whatcom, Skagit, Island and Snohomish counties. Focused on brewing small batches made with locally sourced ingredients, you can enjoy fine spirits like gin, vodka, rum, whiskey, and liqueurs in their welcoming tasting rooms. Cheers! Get crackin' at Magnolia Grill on Saturdays for fresh, sweet and decadent lobster dinners. Served with soup of the day or house salad, seasonal veggies and your choice of potatoes. SKAGIT FOOD DISTRIBUTION CENTER During the annual Take A Bite For Skagit fundraiser participating restaurants donate a percentage of their sales to raise funds for Community Action's Skagit Food Distribution Center. This centralized distribution center provides for all of the food banks in Skagit County. They work behind the scenes to provide 1.5 million pounds of food to 15 local food banks and 4 hot meal programs serving over 45,000 Skagit County residents annually. In addition to being the central distribution hub of Skagit County, they work to serve vulnerable populations in our community by coordinating healthy food delivery to homebound seniors and weekend lunches for school children across the county. They believe that all Skagitonians should have access to healthy, nutritious food to thrive at school, work, and at home. They buy produce from local farms that is in high demand, but less frequently donated such as beets, cabbage, carrots, green beans, tomatillos, etc. They also purchase top quality produce at a discount while helping local farmers to cover their harvest costs when a purchase deal falls through. Proceeds from last year's Take A Bite For Skagit went directly to purchasing, storing, and distributing fresh produce items to the 15 foods banks and 4 hot meal programs. stand in West Mount Vernon! Drive up and enjoy a delicious French Vanilla Latte with one of their fresh, seasonal scones. Milk and cookies? How about a Blended Caramel Latte and a Giant Cookie at  The Coffee Barn! Stop by one of their four convenient locations in Skagit County. BREAKFAST & BRUNCH It's the most important meal of the day, so start yours off right at  The Woolley Market in SedroWoolley with a scrumptious Breakfast Croissant. The Farmhouse Restaurant in Mount Vernon serves up Swedish Pancakes with homemade lingonberry butter! It's really not brunch without a Mimosa.  Third Street Cafe in Mount Vernon uses organic orange juice in the classic morning cocktail. AFTER-DINNER DRINKS It's always 5 o'clock somewhere! Unwind with a Juicy Red Flight, a trio of red wines, at  La Conner Sips. Find your new fave with a Beer Tasting Flight at  Birdsview Brewing Company in Concrete. Head over to La Conner for the distinctive, herb & citrus-infused Polish Vodkas at Anelia's Kitchen & Stage. They are made in-house! e've got three scrumptious Foodie Adventures featuring all of your fave comfort foods. Burgers, pizza and tacos, oh my! BURGERS Guacamole isn't just for tortilla chips! After you try the yummy Guacamole Bacon Burger at  Birdsview Burgers in Concrete, guac may become your favorite burger accessory. Also on State Route 20, Cascade Burgers offers another way to eat bacon: in their decadent Blue Cheese and Bacon Burger! A premium American Kobe Beef Burger is waiting for your choice of toppings at  La Conner Seafood & Prime Rib House. The signature Havoc Burger from Flyers Restaurant & Brewhouse in Burlington does suggest mayhem with its killer combo of BBQ sauce, double-smoked bacon and onion rings. PIZZA Love both barbecue and pizza? You don't have to choose! Cascade Pizza in Sedro-Woolley has an all-in-one BBQ Chicken Pizza. Head over to Concrete for  Annie's Pizza Station's Supreme Pizza. With three different meats and lots of veggies, they aren't kidding around. With a Take 'N' Bake Hawaiian pie from Papa Murphy's Pizza in Anacortes, you can have hot, bubbly pizza right out of your own oven. Aloha! Thank you to our Take A Bite For Skagit participating restaurants. Balance Your Health With Juicing By Dr. A. Nicholas Martin, D.C., C.C.E.P. o perfectly balance your health you need three basic things: a healthy diet, regular daily exercise and regular chiropractic adjustments! Juicing is the path of least resistance when it comes to consistently getting all the nutrients your body needs. It is the fastest way to add all the fruits and vegetables you need with the least amount of effort. For example, one glass of carrot juice can contain as many nutrients as three carrots. Drinking a glass of juice is a lot easier than eating three carrots. Especially when the alternative is often eating no carrots at all. The more nutrient-rich raw materials you consume, the more energy is available. Your body uses a process to store and use energy that I like to refer to as energy cash. The amount of energy cash available to your body affects how efficiently you are able to perform day-to-day tasks. It even affects how much energy you have to sleep efficiently. When your body does not have enough energy cash, you need a kind of jump start to provide that boost of energy and that is where juicing comes into play. I encourage everyone to get a juicer and drink at least one glass per day. 3 stalks of celery 1/2 large cucumber, cut into quarters 1 medium apple, cut into eighths 3 carrots, with the tops removed Optional add-ons: Golden beets, ginger, spinach (you can't even taste it! ), or a pinch of mint. Wash and cut each of the ingredients. Juice all of the veggies and fruit. Drink the juice right away, or save it in an airtight mason jar for up to 24 hours in the fridge. Shopping & Services The Great Northwest is filled with great boutiques, unique shops, salons and spas. Plan your next shopping spree and finish the day with a massage at a regional spa! NORTHWEST EXCELLENCE Since 1984, the knowledgeable staff at Holiday Sports has helped enthusiasts enjoy the ultimate experience in fishing, hunting, camping, hiking, and boating. f you love hunting for one-of-a-kind items, we have a few great stops for a day of antiquing, salvaging, and shopping local! A FINE VINTAGE With many vendors under one roof, you're bound to find some gems at Ferry St. Antique Mall in SedroWoolley. They carry an impressive variety of toys, books, postcards, antiques, collectibles, and home decor. Perusing through the vast assortment of vintage goodies at The Red Door Antique Mall in Mount Vernon is like a walk down memory lane! From classic kitchen wares to furniture to fun knick-knacks, it's easy to lose track of time.  Red Rooster Antique Mall in Freeland is a charming red building housing cottage style home decor and antiques. If you find a piece that just needs a little love, they carry a line of paints and finishes to give it a second life! here’s nothing like escaping into a great book. You’ll see why the Northwest is a book lover’s dream when you go on our Bookstore Adventure!  Village Books in Fairhaven is a three-story bookstore offering new, used, and bargain books. Upstairs you can get a latte and a truffle from Evolve Chocolate + Cafe to enjoy while you read your book. You can also find handmade gifts for writers and book lovers in their Paper Dreams gift shop next door! What goes together better than a book and a cup of Joe? Why, a book, coffee, AND a chocolate chip cookie, of course!  Pelican Bay Books & Coffeehouse in Anacortes accepts books for trade credit or cash. They also sell delicious coffee, delectable cookies and thousands of used and rare books each month! If you like a good hunt,  Easton's Books in Mount Vernon specializes in used, out-of-print and collectible books. You can find the volume you want from their inventory on their website. They have subjects ranging from Agriculture to Travel. he Great Northwest is home to many gifted artisans who create one-of-a-kind wares and specialty food for the discerning shopper. ARTISAN GIFTS Artist and designer Shelby Sneva of Sown Designs creates stunning, fine and re-purposed leather accessories inspired by the PNW. Whether you choose a Mountain Scape Tri-Fold Wallet or a Reversible Braided Cuff, youâ&#x20AC;&#x2122;ll be thrilled with her distinctive fashions. The hand-thrown dishes, bowls and cups of Blue Water Pottery are stunning enough to put on display but practical for everyday use. Artist Jeremy Noet and his wife Megan use vivid colors and glazes for a stunning effect on every piece. hether you are looking to update your wardrobe or do a house make over, itâ&#x20AC;&#x2122;s time to get the girls together and go on a shopping spree at some of the regions most stylish boutiques. Maple + Moss Boutique is located in the historic area of downtown Snohomish and features wardrobe must-haves like cozy sweats, the perfect little black dress, and fun graphic tee's. to dress up your wardrobe with the perfect heels or a cozy cardigan for layering up in the NW weather. Pretty Simple Boutique in Burlington is a woman's fashion boutique showcasing a collection of cute clothes, essential accessories, and trendy jewelry. Posh Upscale Resale & Handbag Consignment Store in Bellingham are two stores under one roof! You can browse their designer consignment clothes and find the perfect purse to match! Featuring styles by Gucci, Chanel, Burberry, and others at discount prices. Collections Boutique in Coupeville is a quaint clothing shop for ladies that appreciate distinctive, well-made fashion and accessories. With quality lines including Habitat, Picadilly, and Tribal, you'll find an outfit (or two) that makes you look chic! Find even more boutiques on FB.com/StyleInTheNW! ometimes you just need to take some time to treat yourself and unwind from the tension of the hectic pace of modern life, and thereâ&#x20AC;&#x2122;s no better way than with a massage. We've created this guide with a selection spas offering different types of massage. Red T Spa in Arlington (360) 657-0507 Must try: Quick Pick Me Up Massage Treat yourself from headto-toe in just an hour. This package includes their herbal bath foot exfoliation, a facial, a paraffin treatment, and a massage. The Suite Salon & Spa in Arlington (360) 435-1593 Must try: Ultimate Neck & Shoulder Massage Hydrotherapy, aromatherapy and trigger point therapy are combined with traditional massage techniques for Ultimate relaxation. The Seaside Spa & Salon in Coupeville (360) 678-0508 Must try: Warm Honey Massage This spa uses rosemary and honey combined with rhythmic massage to boost microcirculation and help you unwind in just one visit. Adara Salon & Spa in Mount Vernon (360) 336-2985 Must try: Elemental Nature Massage Let their heated bed soothe your aches and pains and enjoy your favorite Aveda aroma during this custom tailored experience including Acupressure, Swedish Massage, and Hot Stone therapy. Zazen Spa in Bellingham (360) 715-1050 Must try: Signature Jade Stone Massage Relax as this spa uses jade stones to relieve muscle tension and alleviate pain without any discomfort. ver the 15 years on-staff at a community newspaper in California, Marianne Stickles' responsibilities were taking pictures connected to news stories, city council meetings, and community events including award ceremonies and banquet dinners. Today, she cannot wait to get out into the beautiful outdoors to share what she sees through her lens of our vivid sunsets, farmland vistas, soaring eagles, and all of the beauty the PNW has to offer. The Barn on the front cover - The moody sunset behind the barn was captured by Marianne as she stayed close to the road. Marianne recalls the sunset and smokey skies that colored it from a forest fire that reflected light in the barn windows giving a reddish tinge to the golden wheat. The Tulips on this back cover - Marianne's desire for a photo of tulips with a unique perspective paid off. "This shot shows a worker getting an early morning head start clipping off the tops of the tulips," she explains. The bright blue sky is a delightful contrast to the rows of cheerful pink flowers. Marianne is passionate about capturing the heart of the many unique places she loves in the PNW. "Photography gives an opportunity to see life and nature through the photographer's eyes. It's about creating an experience for the viewer and the hopes that there's a connection made to enjoy something that I see and want to pass on to others."